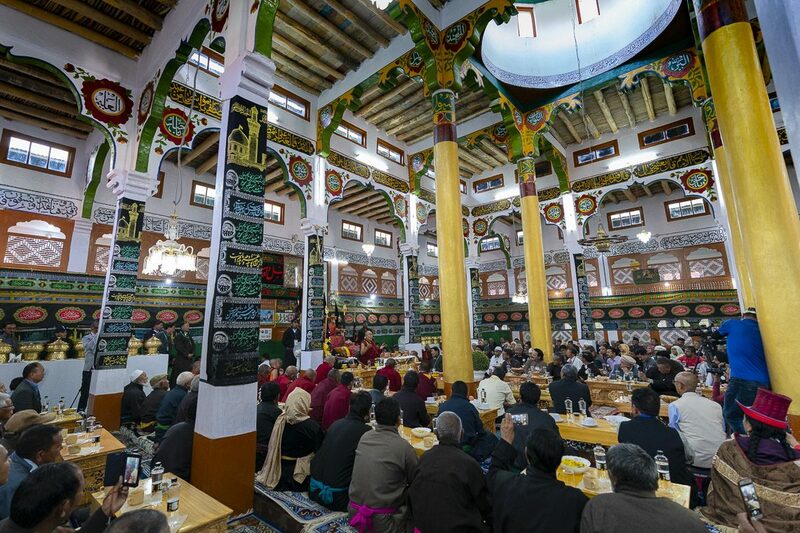 Ladakh: His Holiness visited the Chushot Yokma Imam Barga Mosque on August 2. The community representative expressed hope for organising a conference of Muslims in Delhi later this year, in light of His Holiness’ advice on maintaining harmony among different faith. His Holiness said as human beings, we all have to live together on this planet. Likewise, Muslims and Buddhists in Ladakh have to live with each other, His Holiness continued. Calling the genesis of all problems facing mankind to narrow minded approach and religious allegiance, His Holiness said, among Muslims, Sunnis and Shias pray to the same Allah, but quarrel with each other. Buddhists pay tribute to the same Buddha, yet indulge in sectarian conflict. Expressing his admiration for the spirit of the European Union, that seeks to work for the common interest of the people than over national interest, His Holiness decried Brexit and said he still doesn’t understand why Britain chose to leave the EU. Time is now to give top priority to shared, common interests, His Holiness said. Citing the case of Tibet, His Holiness said Tibet was an independent state, but now Tibet and China can mutually benefit each other. Speaking about inter-religious harmony India, His Holiness said that as a Buddhist he tries to promote such harmony wherever he goes. His Holiness said that Indian Muslims have a responsibility toward their fellow Muslims in Afghanistan and in the Arab world and therefore must promote religious harmony between Sunnis and Shias. “Indian religious leaders should take a more proactive role in instilling the sense of possibility for peaceful coexistence of different religious traditions,” His Holiness concluded. His Holiness will arrive in Delhi today and begin engagements in Goa and Bengaluru.